We are focused on providing beautiful, healthy, and biddable (trainable) 4 -legged companions for families who want to spend time with a dog. Our training takes this goal to the next level. Our “Focused Puppy Training Program” for 10 week old trained English Cream Golden Retriever puppies is available for all of our litters. We train our puppies in a way that changes the puppy from the inside out. We start with training a good attitude in a puppy. The very foundation of our program is FOCUS! Every aspect of our program is built around the idea that behaviors are secondary to attitude. Almost all homes can benefit from our 8-10 week program for one or more of the following reasons. One very important reason for offering this service is to give puppies additional time with litter-mates. This extra time with litter-mates gives puppies a better foundation for relating to other dogs. And more importantly litter-mates teach each other bite-inhibition. Having good bite inhibition creates a gentler mouth. These 10 week old English Golden Retriever puppies are less mouthy than puppies leaving litter-mates sooner. Another advantage for later pick up is that 10 week old trained English Golden Retriever puppies can be with us at the optimum vaccine time. Puppies vaccinated at older ages have fewer vaccine side effects. They also have a greater chance of having an immune response to the vaccine. Puppies leaving at 10 weeks will need only 2 more puppy vaccines. Also, it is best to wait a full week after a vaccine before possible exposure to the disease. It takes 6 or 7 days for a Parvo vaccine to take full effect. For puppies staying with us until at least 10 weeks, we give the first vaccine right at 9 weeks. Puppies go through a fear stage that peaks at 8 weeks and goes through about 10 weeks. By 10 weeks, most puppies are completely out of it. Another advantage that we’ve found in sending puppies home later revolves around the immaturity of young puppies’ digestive systems. Many 8-week old puppies experience digestive upsets when changing homes. Far fewer experience the upset at 10 weeks. Finally, we’ve found that many people are either inexperienced with puppies. Many more have experience that is so far in the past that they don’t remember much of it. Training an 8-week old puppy is time consuming, sleep depriving, and sometimes exhausting. Very few 8-week old puppies are able to sleep all night in a crate without needing to go outside. More than half of 10-week old puppies are able to hold it for 6 hours. Our 10-week old puppies are not fully house-trained by any means. However, by 10-weeks of age, our puppies are accustomed to peeing and pooping almost exclusively outside. Their bladders are a little more mature than at 8 weeks enabling them to hold it longer. If you will take our 10-week old puppies out often enough, the number of accidents will be minimal. See our 10 Week Videos page to see videos of a litter of 9 puppies. Most of these puppies were trained in 2017. These are good examples of the results of the training we provide. The exact ages of the different puppies is stated on the video. This should give you an idea of how far along our puppies usually are at various ages. Listed below is what we work on with these puppies. No puppy can be fully trained and dependable in any area until they are close to a year old. This program is just a start. However, it is a very good start for trained English Golden Retriever puppies who are only 10 weeks old. We take away all indoor litter areas the day after our regular pick-up days. At this point, we work with them on doing all of their business outside. Most people don’t have a doggy door. However, we’ve found that puppies that are fluent with a doggy door and doing their business outside are highly motivated to get outside when they have to pee or poop. If new family members will open the door to let them out frequently, they train incredibly easy. We spend the time between 8-10 weeks conditioning puppies to like the crates before we begin using the crate for containment for extended periods of time. All meals are fed in crates. Favorite bones are only given in crates. Puppies are given treats when they are sitting quietly in crates. We work hard to make sure that puppy crate time is not only tolerable, but that puppies actually like it. It is important that puppies develop a love for a crate before they are forced to spend long periods of time being confined. We start our crate-conditioning by leaving our puppies in their crates by slowly and incrementally increasing their crate times. This work takes place at meal times. We start 8 week old puppies with less than a minute. Our ten-week old puppies are used to being crated for 30 minutes at a time when wide awake. Training a puppy to be happy when awake is the hard part. If puppies are asleep, puppies are happy in there for MUCH longer. By the time puppies are 13 weeks, they are used to being in crates for up to 2 hours. We begin working on elimination of bad behaviors such as jumping and mouthing by enforcing good behaviors. We never rewarding the bad ones. Puppies are interacted with in such a way that they physically are unable to get to our hands with their mouths. Instead, we re-direct them. We play with them with toys instead of our hands. We never pet puppies over 8 weeks when they jump on either us or on the side of a pen. Instead we teach them to sit for attention. These bad behaviors take far more time to get rid of than this short training time provides. However, we start the process. Puppies (and dogs) also learn very quickly who will allow them to jump on them and who will not. New families must be consistent and continue the training. Our meal-time routine teaches respect and pack leadership without punishments. It also teaches puppies to make eye contact and to have self-control. We work with each puppy individually on getting in a crate, turning and sitting, and holding eye contact. Then we release them to eat. Puppies then spend increasingly longer periods of time in the crate with bones and random treats. After meal/crate time is over, puppies work on waiting again for a release command in order to exit the crate. This routine is carried out 3 times a day at meal times. Teaching a puppy to focus and look at his owner should be the foundation of all training. Focus is our priority at Summer Brook. A puppy that is not focused on a person, but instead guided purely by food and leash pressure will never be a good obedience dog. Our primary goal is to produce puppies that WANT to look to their owners for direction. We teach these puppies to do so out of habit and a desire to please. It is not necessary to have puppies obey out of fear. 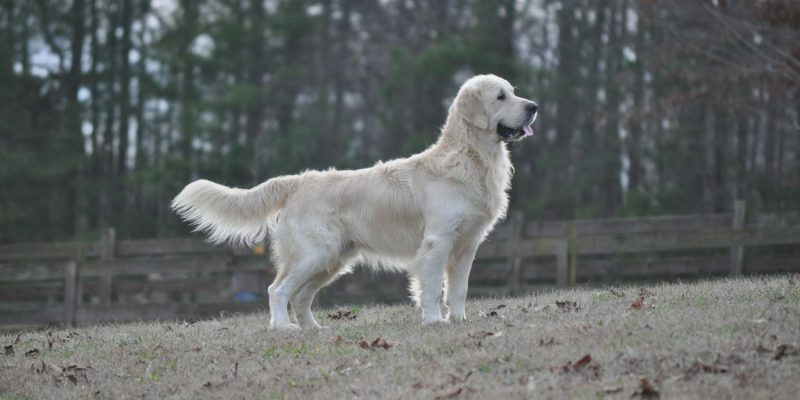 English Golden Retrievers tend toward having softer temperaments and need more socialization than many other breeds. We expose our puppies to the normal sites and sounds of a busy home. Ou puppies are exposed to various outdoor areas, to various floor and ground surfaces, and to tight spaces. We introduce them to steps, and to a variety of sounds. Field trips away from our home are not a part of the program until puppies are over 10 1/2 weeks of age. We start teaching the sit and down command as well as walking on leash and the look command just after 8 weeks of age. With larger litters with families wanting training, we start shortly after 7 weeks. The place and stay commands are not introduced until sits and downs are the norm with just a hand signal (no luring with food). This is usually just a few days before 10 weeks old. None of these commands are solid at 10 weeks but we give a very good introduction. The focused leash walking that you see on the videos can only by maintained by puppies this age for very short periods of time. It takes 100’s of hours over months of time and an older, more mature dog to maintain that kind of focus for long periods of time. This formal heeling is usually not kept up by new owners. However, the early training we provide in this area helps to build handler focus while moving. We therefore consider this training very important in attaining our overall primary goal . We create puppies that WANT to focus on a handler in both stationary as well as moving exercises. The videos on our trained puppies page give good examples. These videos show where our average puppy will be in obedience training by the end of the program. The puppies in our videos are by no means perfect,. 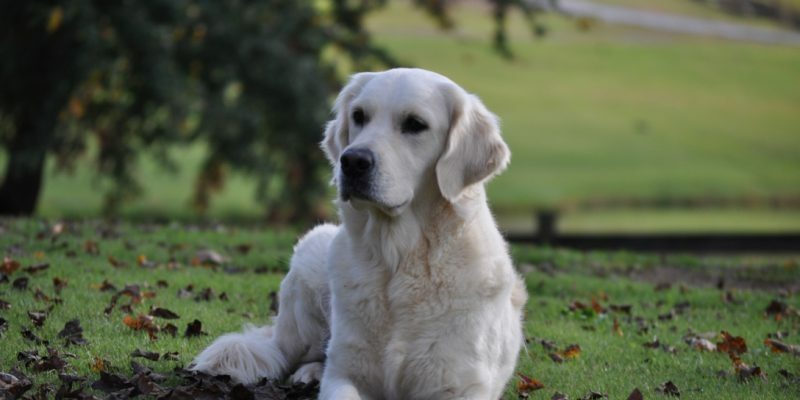 However, for 10-week old trained English Golden Retriever puppies, we do an incredible job. We do not have our puppies sleeping at night in crates at this age. They have free access to outside through a doggy door until we are sure that they are easily able to consistently hold their potty overnight. We do not get up with these puppies through the night. Instead, we work during the daytime to create a love of a crate in them. We make almost all of their experiences in crates positivewith the exception of our gradual increase of time spent in the crate. There is the occasional crying pup in the crate. However, by far with our methods, our puppies not only accept a crate, they choose it for themselves. We do not heavily focus on house-training nor do we spend a lot of time on it. We go in and out with our puppies until they are fluent with doing all of their business outside through a doggy door. About 95% of our puppies are to that point by 8 weeks of age. House-training comes naturally as our puppies develop and grow. Our goal is to train the things that most people cannot train and to leave the easy things (such as opening and closing a door for a puppy to get outside) to you. We’ve house-trained puppies both with and without a doggy door and the differences in the results are negligible. House-training is mostly a matter of teaching bladder control and creating a consistent habit of doing business outside until they grow up enough to be trusted. We do not use corrections with these young puppies. Instead, we divert their attention from undesirable habits. We provide them plenty of exercise. We control their environment so that they have no choice but to behave themselves. They learn quickly that if they want attention, they must behave on our terms. This method of training works far better than punishment based training. However, it takes time for bad behaviors to extinguish themselves. By 10 weeks of age, hardly any of our puppies mouth us. Jumping is minimal when one-on-one with individual puppies. However, at this young age, they are still testing the waters. New families must show their puppy that they have the same expectations that we have. Families also must provide other ways for puppies to play. You cannot expect a 10 week old puppy to sit quietly to be petted when he hasn’t been given sufficient exercise and mental stimulation. Here at Summer Brook, our puppies are kept very busy during the day. 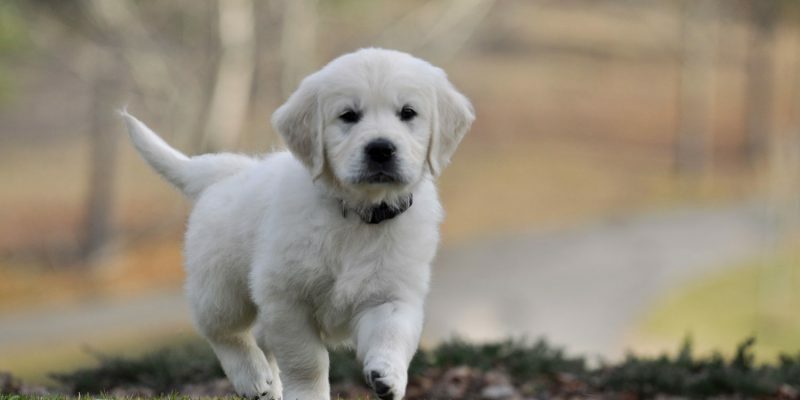 Our trained English Golden Retriever puppies have a very scheduled day with training, socialization, and play. Therefore, they are ready for calm indoor petting sessions. We provide a very controlled environment. This sets these young puppies up for success rather than giving them all sorts of temptations. We don’t want there to be temptations calling for punishments. It’s not fair. For example, we keep our shoes off the floor rather than punishing a puppy for chewing them. We provide lots of toys so that there is no need to chew the furniture. When our puppies aren’t in pens, someone watches them very carefully so that they don’t chew anything undesirable. When they do, we simply divert their attention rather than punish them. A well-timed punishment can have its results in deterring certain behaviors. However, punishments come with a price. Punishments unless very mild and fair and understandable in a dog’s mind will affect a dog’s confidence level and their desire to please a person. We don’t think the benefits of corrections are worth the cost with young puppies so we don’t use them. The method used by a trainer is more important than what is taught, especially in puppyhood. Any trainer can quickly teach almost any behavior using punishment based or aversive training. However, these quicker training methods come with a cost to a puppy’s confidence, drive, and enthusiasm for work. Though punishment based training can give quicker results for the short-term, positive training gives longer lasting results. Please see our page on our Training Philosophy for more information on how we train. We do one final set of pictures during these 2 weeks usually around 8 1/2 to 9 weeks of age. We post one video to YouTube just before puppies go home. For those wanting to leave their puppies for only a portion of these two weeks, we offer a few options. Puppies picked up between 8 and 9 weeks will have a boarding fee of $50/day. See our puppy pick up page to see what our boarding plan includes. All puppies left over 9 weeks will be started in our training program. Puppies picked up between 9 weeks and 9 weeks 6 days will be started in all that is discussed on this page except for the sit/stay which is usually not started by us until close to 10 weeks. This includes sit, down, stay at a down, walking on a leash, waiting for food and to exit crates and pens, and of course the hallmark of our program, focus. Puppies picked up even a day before 10 weeks will not be started at all with a sit/stay as there is not enough time for the reliability of it to be even worth the time to start it. Puppies picked up at 9 weeks will be started in all exercises. However, the reliability of all of the exercises will not be close to that of a 10 week old puppy. In fact, there is a marked difference between even a 10 week and 10 1/2 week old puppy with regard to reliability with all training. Many of our 10 1/2 week old puppies are too big to fly in the cabin, especially the boys. Our average boy weighs between 15 and 16 pounds right at 10 weeks. Therefore, we encourage families flying with boys to pick up their puppies as close to 10 weeks as possible. 20 pounds including the weight of a 4 pound carrier is the official weight limit for most airlines. However, as of the end of 2018, we’ve only had one person to EVER have their puppy and/or carrier weighed. We have so far never had anyone turned away from flying in the cabin. We’ve even had several puppies fly out at 12-16 weeks of age in a medium Sherpa carrier. These puppies were several pounds over the official weight limit. It was tight but the puppies just curled up and went to sleep. No matter the weight of your puppy, you still must come to our home to pick up your puppy. We do not ship. If your puppy is too big for you to feel comfortable taking him in the cabin and you need to fly, the only choice will be for the puppy to ride below. So far, no one has chosen this option. If you should choose for your puppy to fly with cargo, please book only a direct flight. The Birmingham airport is limited with regard to direct flights. However, we are about a 2 1/2 hour drive from the Atlanta airport. Atlanta has direct flights to most airports in the country. There will be an additional $75 charge if your puppy needs a health certificate. As of the end of February 2019, to our knowledge no airline requires a health certificate for in cabin flights. Delta required a health certificate for in-cabin travel for a part of 2018. However, they have now reversed that policy and no longer require one. Keep in mind, though, that airline requirements are changing daily. Please consult your own airline. Make sure that whoever you are speaking with understands that you are asking about in-cabin travel. All airlines require health certificates for travel underneath.